Holovis will be unveiling MotionDome, the next generation of immersive dark ride and gaming technology, to the U.S. market for the first time at IAAPA Attractions Expo on booth 3805 from the 19th – 22 November at the Orange County Convention Center in Orlando, FL. Working with visualisation experts Barco and projectiondesign, MotionDome is an immersive and interactive platform for creating transformative experiences in 2D or 3D. Audiences are fully surrounded by a 360° projection and the ability to incorporate real time, interactive game technology and subtle motion that takes story-telling to the next level. The solution is scalable from small to large full-dome theaters using motion systems from single and dual-person setups to full-scale multi-person 3DOF and 6DOF motion platforms. The IAAPA solution has been created using four F35 AS3D active stereoscopic 3D DLP projectors seamlessly edge blended on the Holovis MotionDome curved screen display, positioned above the participant’s eye line. 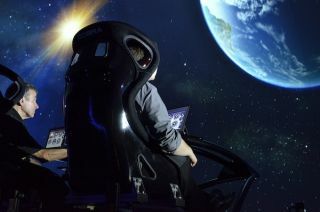 The experience is completed with Holovis motion-seat technology and driven by In-Mo, a proprietary Holovis gaming and control technology that integrates real-time interactive media into the Holovis multi-channel immersive domes and virtual reality solutions.